The human ear has three divisions: the outer, middle, and inner ear. The outer ear consists of the auricle and external auditory canal. The middle ear begins at the tympanic membrane (tympanum or eardrum) and ends inside the skull, where two small membranous openings, the oval and round windows, are located. Three small ossicles are between the tympanic membrane and the oval window. They include the malleus (hammer), incus (anvil), and stapes (stirrup), so named for their shapes. 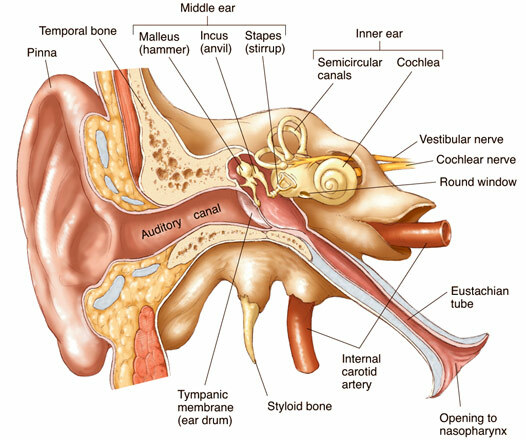 The malleus adheres to the tympanic membrane and connects to the incus The incus connects to the stapes, which adheres to the oval window. The auditory (eustachian) tube extends from the middle ear to the nasopharynx and equalizes air pressure between the middle ear and the throat. Sound waves enter the outer ear and create pressure waves that reach the tympanic membrane. Air molecules under pressure vibrate the tympanic, membrane. The vibrations move the malleus on the other side of the membrane. The handle of the malleus articulates with the incus vibrate it. The vibrating incus moves the stapes back and forth against the oval window. The movements of the oval window set up pressure changes that vibrates the fluid in the inner ear. These vibrant. ), ire transmitted to the basilar membrane, causing it to ripple. Receptor hair cells of the organ of Corti that are in contact with the overlying tectorial membrane are bent, causing a generator potential, which leads to an action potential that travels along the vestibulocochlear nerve to the brain for interpretation. Vibrations in the cochlear fluid dissipate as a result of movements of the round window. 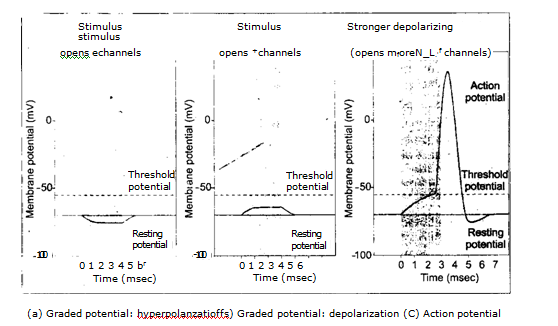 Humans are not able to hear low-pitched sounds, below 20 cycles per second, although some other vertebrates can. Young children can hear high-pitched sound up to 20,000 cycles per second, but this ability decreases with age. Other vertebrates can hear sounds at much higher frequencies. For example, dogs can easily detect sounds of 40,000 cycles per second. Thus, dogs can hear sounds from a high-pitched dog whistle that seems silent to humans. The sense of equilibrium (balance) can be divided into two separate sense. Static equilibrium refers to sensing movement in one plane (either vertical or horizontal), and dynamic equilibrium refers to sensing angular and/or rotational movement. When the body is still, the otoliths in the semicircular canals rest on’ hair cells (figure-a). When the head or body moves horizontally, or vertically, the grangules are displaced, causing the gelatinous material to sag (figure-b). This displacement bends the hairs slightly so that hair cells initiate a generator potential and then an action potential. Continuous movement of the fluid in the semicircular canals may cause motion sickness or seasickness in human. Fig.2.25.